Wold Top Brewery was awarded the 2013 SIBA National award for 'Best Green Business'. 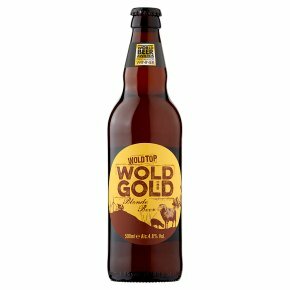 Here they have brewed a blonde beer using local malts and Wold Top's own chalk filtered water. Goldings and Styrian hops give the beer a soft, fruity flavour with a hint of spice. Great with a curry. World Beer Awards United Kingdom 16 Winner. Priceless golden blonde beer.A blonde continental style beer, a heady mix of Wold grown Barley, Wheat and Cara malt hopped with Goldings and Styrian Goldings hops give the beer its soft, fruity flavour with a hint of spice. Year on year, one of our best selling bottled beers. Beer and curry..... this is the one!